As vintage jewelry aficionados, we each have our special favorites and those most-treasured pieces tend to come with a personal story. Sometimes about how we found a piece, or who gave it to us or our adventure in buying it. The best part of any vintage jewelry narrative is about why the piece is so precious to us. For my Jewel Notes this month, I want to share a favorite vintage jewelry story. It begins in 2006. Randy Smith, my best friend who also just happens to be my husband, is a flag manufacturer, so I’ve had an interest in all types of flags for many years. I was cruising eBay and searching for flag-themed vintage jewelry. 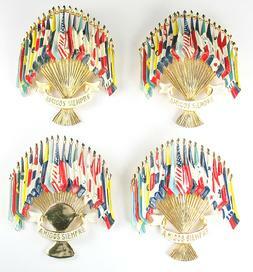 One of the auctions that appeared was for a really cool pin with not one, not two, but a whopping 21 flags. And each one on a flag pole! A combination of flags and vintage jewelry; it doesn’t get much better than that for me. My “gotta have it” gear immediately engaged and so began my journey of discovery about the “Amigos Siempre” brooch produced by Coro. When my brooch arrived (like many eBay purchases, very carefully wrapped in two layers of used, stained paper towels secured with ten bands of scotch tape), I held this miniature work of art in my hands and fell in love. Here were 21 individual national flags, all executed in colorful enamels, each flagpole crossed at the bottom and overlaid with a white ribbon inscribed “AMIGOS SIEMPRE” (Friends Forever). The next step was to learn more; why these flags and why these words in Spanish? 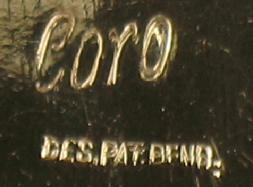 Clue number one: The back was marked “Coro” in script and “PAT. No. 130836”. Pretty good clue, huh? So now I knew that this brooch was designed and first manufactured in 1941. Not many of you know this, but I am a vexillologist and have served on the Board of Directors of the North American Vexillological Association (NAVA). Vexillology is the study of flags, and this organization’s members are flag scholars, historians and enthusiasts affectionately known as the “flag nerds”. As an aside, I still believe to this day that one of the secret requirements for being on the Board of NAVA was having the ability to say “vexillology” without stuttering. But, in spite of my flag interest and speech accomplishment, I was unfamiliar with this particular grouping of flags. I first suspected that they represented the nations of the Organization of American States, but easily found that to be incorrect, as the OAS was founded in 1948. While I could have asked one of my many flag nerd, uh, I mean, scholar friends to help with my research, I figured that I might be able to learn something by pursuing this from the jewelry-angle rather than the flag one. I had just received my copy of Marcia “Sparkles” Brown’s book “Coro Jewelry”. And, there is was on page 192; not only a photo of the brooch, but also some detailed information about it. I learned that this flag brooch was made to commemorate the 1938 Friendship Conference of North and South America held in Lima, Peru. With the backing of no less than First Lady Eleanor Roosevelt, it was first produced and sold to raise money for the Inter-American Scholarship Fund. 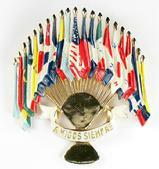 In 1942, the “Amigos Siempre” brooch each sold for $3.95. I was a political science major in college, so naturally, my first thought was “Where is the Canadian flag?” So I did some internet research about the Lima, Peru conference, discovering that the major topics of conversation were Nazi Germany’s occupation of Austria and Czechoslovakia, and a search for peaceful solutions to the situation in Europe. As we know from history, a peaceful solution did not occur and this group of American nations did not meet again until after World War II. Ironically, I was never able to find an explanation as to why Canada did not join this organization of American countries (though they did become a member of the OAS in 1990). Now, at the risk of boring you to death (I’m sure many of you have reached the “tears” stage), I’ll leave off with my history lesson and just say that I was truly enthralled; we’ve now combined vintage jewelry, flags, history and politics in a single piece. Yes, I had fallen in love with my “Amigos Siempre” brooch! The following part of my story is going to sound familiar to many of you; over the next couple years, I diligently searched far and wide for more examples of the “Amigos Siempre” brooch; I managed to find and buy six of them. Nothing like have a ‘healthy” obsession, right? And, as often happens, my small collection of these brooches yielded some new information. First of all, there were variations in the construction of the pieces. Some had joining sections between each of the flagpoles. Sometimes the flag poles were joined to a solid base, and sometimes they were open between each pole. In one example, they were open at the top and solid at the bottom. 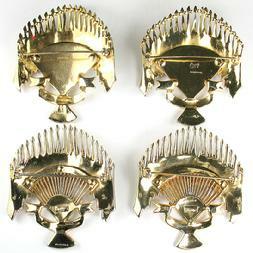 The brooches were always constructed from two sections joined by rivets, but some used two rivets and some used three rivets. So no question about it, this brooch was cast in different versions. The enameling, and the size and positioning of the flags really didn’t vary much, but the brooches were definitely different. Not surprisingly, the backs of my “Amigos Siempre” brooches told me even more than the fronts. While all are signed “Coro” in script lettering, sometimes the mark was engraved into the back and sometimes it appeared on a slightly raised rectangular cartouche. And, the most significant clue of all: Some of the brooches were marked like my first one “PAT. No. 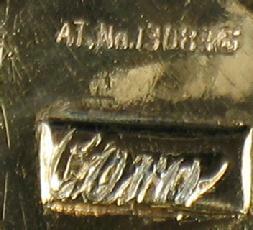 130836”, but others were marked “DES. PAT. PEND.” This was my “ah hah!” moment. As mentioned last month in my Jewel Notes, many pieces of vintage costume jewelry were produced with the “Pat. 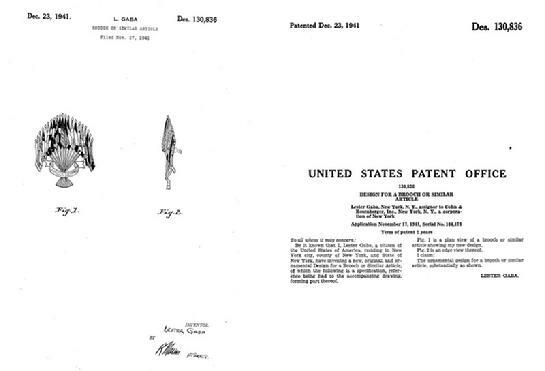 Pend.” mark rather than the actual patent number because manufacture and sales of the jewelry occurred mostly before the patent was issued to the producer. In the case of the Coro “Amigos Siempre” brooch, I believe that the piece was made and sold over a period of at least a few years and this explains the difference in the marks. It also provides a possible explanation for the different versions; they may have been made by different manufacturers using different mold models. It is interesting to note that this piece was probably produced over a longer period of time than is typically the case, and, as a result, more of them were made than is true in general for vintage costume jewelry, especially that produced during the 1940’s. As you can see from the photos, the older brooches (those not yet marked with the actual patent number) are the ones that were made with the metal joints between the flag poles and no openings between the poles. It’s also fun to note that Marcia Brown’s version is the older design; Brunialti’s is the newer one. Speaking of Marcia “Sparkles” Brown, during the course of my research, a question was raised in conversation online among vintage jewelry community members: Did the different version of these Coro pins mean that some might be later reproductions? Having had so many versions in hand, I can say without question that they are not. At the time, I asked for anyone willing to email me a photo of their “Amigos Siempre” brooches so that I could create an album for comparison. Marcia wrote to me to say that, unfortunately, she didn’t have an electronic photo of hers, so couldn’t provide one. About a week later, a package arrived in my mailbox, from Marcia. Inside was her “Amigos Siempre” brooch; THE actual brooch used for her book. She had sent it to me so that I could take some photos, and then return it to her. I was simply blown away by this kind and generous act, yet at the same time scared to pieces. I had nightmares that something awful was going to happen it while in my custody. To my ultimate relief, my fears were unfounded and I was able to return the brooch to Marcia without mishap.